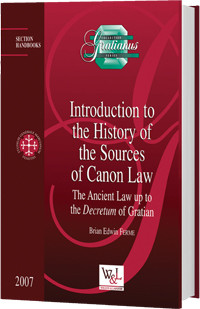 In the last fifty to sixty years, the study of the history of canon law has experienced a remarkable renaissance. Stefan Kuttner and Alfons Stickler, to name but two of the foremost scholars in the discipline, laid the foundations for what is now clearly recognized as an integral part of a full understanding of our cultural legal heritage. "I thank Professor Ferme for having the desire to take up the kind work of making the skeleton of my Historia Fontium Iuris Canonici survive, modernized and completed, largely in his own personal formulation." +Alfons M. Cardinal Stickler, S.D.B.